Here a 1960s complex of old-age dwellings well past their prime has been replaced by new-build that seeks to give a contemporary reading to the spatial qualities of post-war row housing. The 80 apartments for the elderly are laid out in rows that alternately form public entrance courts and enclosed courtyards with gardens. A winding access gallery ties the five rows together. These are stacked stepwise to create roofed parking places. A further 60 apartments occupy a separate ten-storey block with retail space on the ground floor. 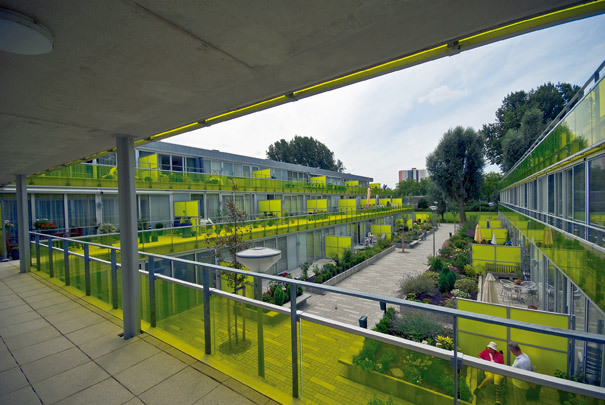 The gaily coloured glass cladding greatly enlivens what is essentially a drab area.